Can you tell that I am still missing Maine? These shots were taken in Rockport. There is a brisk breeze in the air today. their spring is just beginning. As nicely noted by one of you. Magical and mystical. Love them. Delightful. Fog always makes things looks so dreamy and mystical. Stephen King lives in Maine. He wrote a book about The Mist. I like your little poem much better than his book. I guess seeing the picture of the fog, reminded me of the book The Mist.... It might of been a short story, I can't remember. Such lovely captures, Reena, and lovely words to match! Although we get more than our share of GRAY in Seattle, I still love the fog, its mystery, the feeling being able to get lost in it -- lost in a good way. Hope you have a wonderful weekend! Enjoy! Hi renna...so lovely ...yes we also had a change in the air ..10degrees cooler this morning then it has been ! Hope you weekend is a fun one!! The first photo really grabbed me. Love, love, love the haziness and the little pop of green grass to the right. Perfect composition. Lovely photos and poem :) Thanks to blogging, when I mentioned my weather or seasons, in the back of my mind I think of my South African blogger friend whose seasons are exactly opposite. I love it! That fog really is magical - I wouldn't mind seeing it around here sometime. I love your fog pictures! In fact, I love fog! Moody, sparse, and stunning! And I love that little bit of color on the lower right as a contrast to show up the fog even better! I am calling today the first day of fall, because we had to turn on the heat for the first time this season, as it was in the forties last night! Isn't there a poem about fog rolling as quiet as cat feet? 58 for a high here today and dang chilly and overcast. Yesterday it was 89. As we say here in NC, if you don't like our weather wait 5 minutes and it will change. I don't like fog. Give me sunshine. yes, i can tell. these are lovely! Wow, I love these shots. Keep the Maine photos coming I love them. 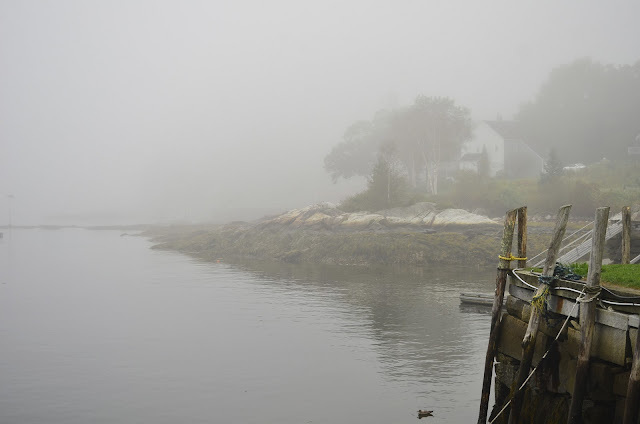 Reena...your fog photos are absolutely fabulous! I just love, love, love fog! I like how it closes the world in around you. These are awesome photos! Crushing on your fog photos here. Nicely done. And I miss Maine too. There is definately something mystical about these wonderful pictures. Ah, love the fog. So mysterious and exotic somehow. makes me want to curl up on the couch, eat brownies and drink hot chocolate or cider. i am so loving these cooler temperatures!! Chilly here today too...a real autumny feel...Have a wonderful weekend Reena! So beautiful! the scene and the fog are perfect. I've never been to Maine but this lets me know what I am missing. Really beautiful and mysterious looking. Oh, I love these. They give off a feeling of mystery. So lovely - and a little mist-ical! I love fog. There is something so mystical about it. that second shot screams magic for sure. i am assuming the weather is not perfect in PA right now? our niece lives in Perkasie and she had to close her pool this week, to cold to swim. Just so you know, it was 40 degrees here this morning: 130 miles south and west of Rockport. It's pretty to look at but brutal come cold weather. I wish it weren't so because living here is da bomb. 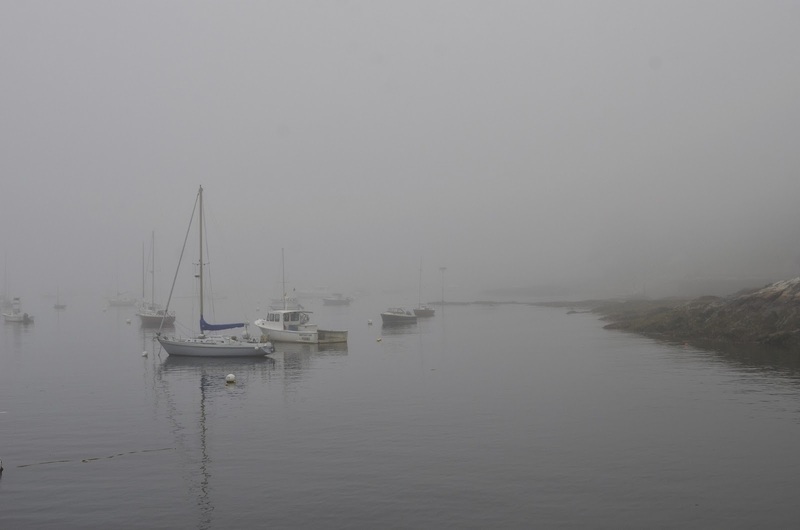 Fog on the water is so magical- unless of course, you are out in a boat. Then it's just scary. Beautiful...I love fog too. It's probably the thing I miss most about living in SF. Lovely images. We get fog like this in Vancouver as well. Nothing too thick, but still beautiful. And it makes for a perfect day of snuggling up with something warm with a cup of good tea. I can't go on more on how I love your photos! reminds me a little of when I lived in Vancouver.. that first picture really pulled me in! love love love!!!!! Fog to me definitely feels so special..., since I don't get to experience it often here in coastal RI. I do remember it vividly from visits to Northern CA..., you only hear the crashing waves and seagulls, but see nothing! Magical indeed!! Oh,... where those cute flip flops always in your header, or am I just noticing them now?? Oh how I love fog. These are just beautiful. When the fog has wind and moistens your face, I like it the best. I never knew fog could be so beautiful! These are such fabulous shots.. Living here in the desert my whole life, I don't see much fog. But when ever I visit the ocean in California I have to say I just LOVE it.. Your writing is amazing.. Such beautiful words with Beautiful photos..
Great capture. The tones are wonderful . I haven't seen fog for so long! Misty photos that draw a person in. LOVE the feel of these photos. Usually I think the sun has to be out, then I think overcast is good. But you took it to a new level. What a great eye you have for photography. I'd recognize Maine fog anywhere!! Lovely images!!! nice...i love the fog...it adds such mystery....nice write...smiles. I love the fog, in certain conditions. And, I think that your photos are excellent. I love the early morning fog. Wonderful scenes and photos. Foggy here this morning -- although my view is much different. Lovely photos. The fog does add a dreamy, mystical feel. Nice. Hauntingly beautiful. I love foggy days. Cheers! !